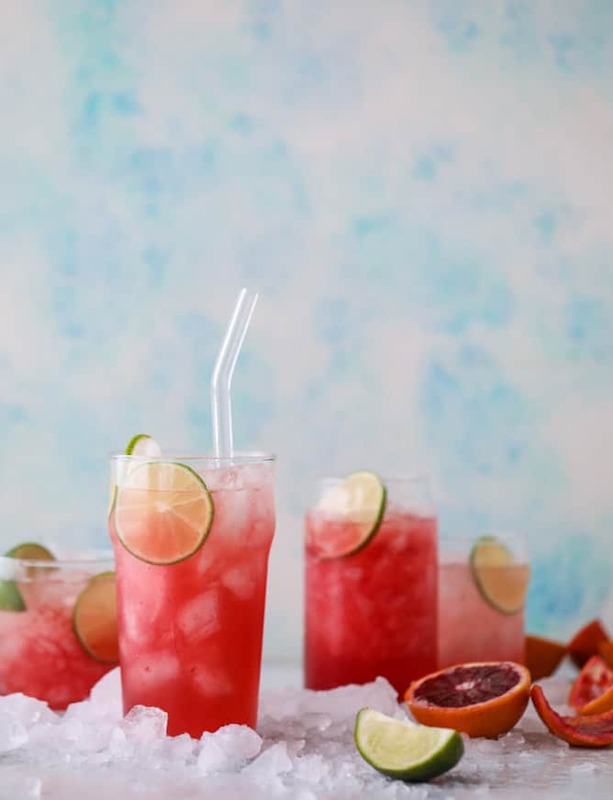 Blood orange mocktail, coming right up! It was between this and a blood orange hot toddy. I was feeling the cooler more than the toddy, you know? I will tell you though, and I say this every single year, that I wish I was a skier, just so I can go sit by a fire in a ski lodge and drink hot toddies. Or boozy hot chocolate. Or whiskey coffee. But really! In these freezing cold weeks that we are having, in all of my stir craziness (which is much stronger with two kids than it ever was with one kid), I keep telling Eddie that we should just go up to a ski resort so we can sit there. Let’s pack up all of our junk with a newborn and a toddler, to drive 45 minutes to… sit there. WHY DOESN’T HE ALSO THINK THIS IS A GOOD IDEA?! It’s dreamy in my mind. Warm lodge, sitting by the fire, snow softly falling outside. 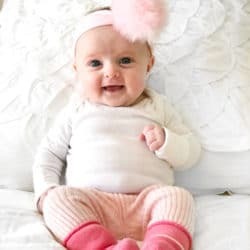 … screaming newborn and toddler also magically just sitting there for one or two hours too. Sounds like it would work, OF COURSE! So anyway. I decided to go with the cooler. For obvious reasons. 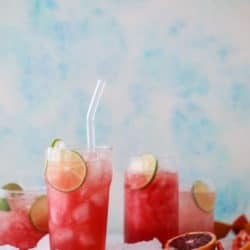 This refreshing drink is filled with freshly squeezed blood orange juice, a touch of lime juice, coconut water and seltzer for some bubbles. We all need the bubbles! I find that the blood orange juice is sweet enough and it really carries the drink – this isn’t tart or sour. But if you’d like, you can always swap that seltzer for some of the blood orange Italian soda that I love SO MUCH. In my grocery store (or in Whole Foods), it’s usually found by the fancy, expensive 4-pack sodas and some of the drink mixers. If you’re looking for something boozy to serve this weekend while watching football or just because it’s… a January weekend (whomp whomp), we still have tons of options! I adore these pink grapefruit margaritas. Grapefruit Daiquiris. We have super old blood orange sangria that is delicious. Palomas, which will forever by a favorite. Meyer lemon shandy sangria too! So many options for all the activities. If you’re still in dry January though? These refreshers and very, well… refreshing! 2 ounces seltzer water flavored or unflavored - your choice! Fill a glass full of ice. Pour over the blood orange juice, coconut water, lime juice and stir it together. Top with the seltzer for fizz! Add in the lime slice. DELISH. I mean, who doesn’t want to drink hot pink?! 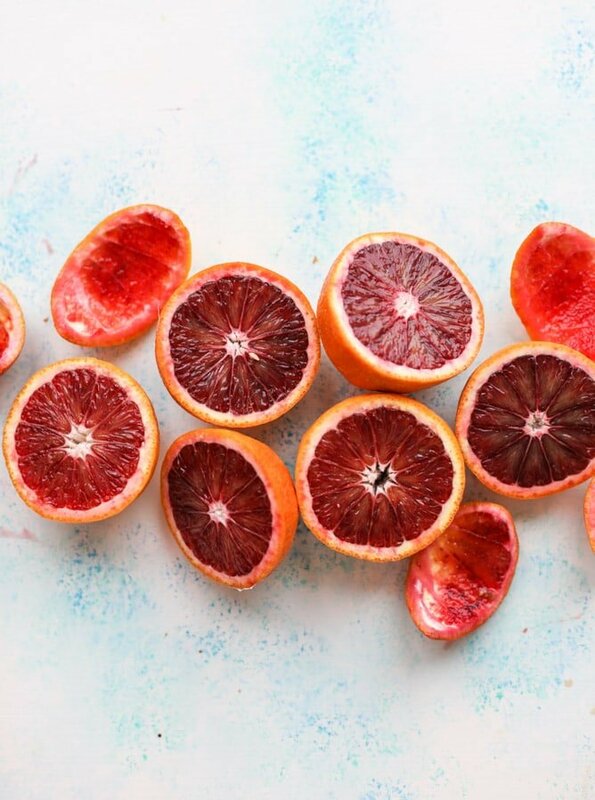 Where to find blood orange? I never see it even supermarket. You make the best mocktails! Thank you! Making this tonight for TGIT! It looks so good for this pregnant mama. Wow! These sound incredible. And the color is amazing!!! 7 Springs should have enough non-skiing activities to entertain your family for an overnight. It’s been quite a while since I was up there but as a kid I remember the indoor pool and the bowling alley. Snow tubing has an age minimum. We were thinking about doing the same thing. so true!! it would be so nice to go for the night. we go during autumnfest and drive through to see the lights at christmas, but haven’t stayed! I made this in my Vitamix and used peeled whole blood oranges. It was great! Oh wow, absolutely loving the colours! I’m ridiculously excited that blood orange season is here so will definitely give this recipe a go!